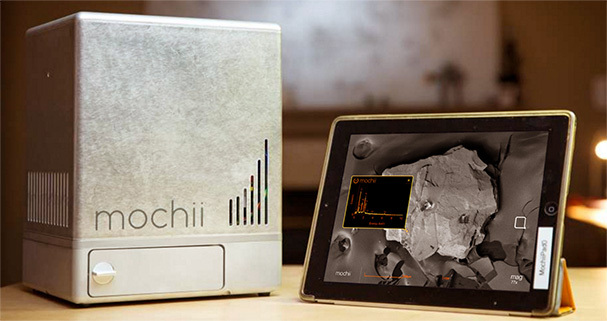 Mochii is an excellent analytical tool for the morphological, textural and chemical characterization of extraterrestrial samples and impact craters produced by exposure to the space environment. Of particular interest are lunar, cometary, asteroidal, and martian samples. During the 2018 Lunar and Planetary Sciences Conference, Voxa founder and CEO Chris Own met with NASA Astromaterial scientist Dr. Kathie Thomas-Keprta, who had brought a fragment of the Martian meteorite Nakhla to the conference. Over coffee in the conference hotel, Drs. Own and Thomas-Keprta loaded the fragment into the Mochii S and collected both images and EDS spectra on the spot, which Dr. Thomas-Keprta sent to colleagues directly from the iPad used to collect them. The figures below show the small ~1 mm fragment of Martian meteorite Nakhla, analyzed in Mochii S for surface composition. In addition to medium and heavy elements (Fe, Mg, Si, Cl, and Ca), Mochii’s EDS detector is able to detect compounds containing light elements such as carbon and nitrogen - elements necessary for supporting organic life - in freshly cleaved surfaces. Direct observation allows learners to develop deeper understanding of scientific phenomena. Mochii delivers direct observation. "placeholder quote text for mochii GeoScience case study goes here."